By the end of Tulip mania in the 1600s, a single tulip bulb was traded for a house. The subsequent market crash effectively ended the Dutch Golden Era. A few years after that, Jonathan Swift lost money in a shipping company investment, which he dubbed the “South Sea bubble”, from which we get the term bubble. Economic bubbles reveal much about market dynamics and how these interact with human psychology. 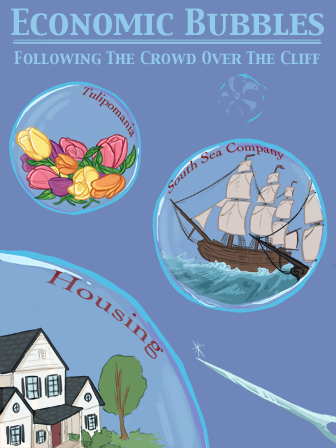 Although attempts have been made to make bubbles a thing of the past, the tech and housing bubbles of the last generation suggest otherwise. This book will help students understand the flux and flow of the economy. It will also help them to understand what caused the most recent US recession.